NOW THIS IS SCIENCE! IF YOU WANT TO CONTRIBUTE TO ASTRONOMY, HELP US MAP THE SHAPE AND SIZE OF ASTEROIDS. An “occultation” is undoubtedly one of the most profoundly amazing sights that the amateur astronomer can ever witness. Occultations are similar to eclipses in that they involve the passage of one celestial object in front of another. This process creates an astronomical opportunity to study the nature of one or both objects and offers professional and amateur astronomers chances for continuing research; it is one of the major goals of the International Occultation Timing Association IOTA and public outreaches by the NASA Johnson Space Center Astronomical Society. Our main thrust is to stimulate interest in the amateur ranks worldwide by predicting and advertising the appearance of occultations in almost every corner of the globe. Paul describes how to access predictions for asteroid occultations to monks at a Bangkok, Thailand internet protal (March 2003)Asteroids are typically 100 to 200 million miles away from earth at any given time though a relative few may come as close as a fraction of the distance between the earth and moon! The stars they eclipse are trillions of miles away. 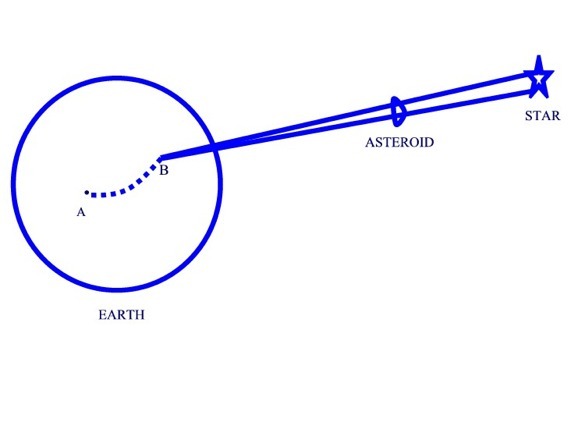 To illustrate this consider the following diagram where an asteroid in its orbit about the sun lines up geometrically between a star and an observer on the earth. A shadow is cast onto the earth that sweeps across the ground typically moving in proportion to the speed of the asteroid and the rate the earth rotates on its axis from west to east. In our example the distance from A to B is about 1000 miles and the time for this shadow to sweep across the earth from A to B is about 4 minutes. Geometry of the Earth, an asteroid and a star that allows an occultation to occur somewhere on the Earth. In Clanwilliam, South Africa, May 2017 supporting a NASA funded effort to observe an occultation of a star by the remote Kuiper Belt Object 2014 MU69. If, as an amateur astronomer or telescope owner, you are thirsting to feel relvant, to do something meaningful in your life and to see sights that few have every witnessed, then occultations are the thing for you. The occultation process offers discovery and research. It is possible for amateur astronomers to discover new companions of stars, help to improve the polar diameter of the sun and moon, identify the existence of possible satellites orbiting asteroids, to improve knowledge of heights of lunar mountain peaks and depths of valleys in the polar regions, determine corrections to ephemeris errors and assess star position errors, improve knowledge of the shape and sizes of asteroids, and more through occultation science. It does not matter where you live in the world. If you have access to a computer and possess a telescope of at least 4-6 inches, know your geodetic position either from GPS or a good topographic map, have a source of time signals and tape recorder, you can make your own observations of these rare and critical events. The IOTA web site contains predictions that are updated frequently. You should have knowledge to find your way about the sky. Most stars that are occulted by asteroids average apparent visual magnitude 10. Off the shelf camcorders with RCA video/audio input jacks and low light video cameras are better tools to record the occultation process. I urge you to read in detail the information presented here to see if you might want to try your hand at this activity. More information can be found annually in popular articles published in SKY AND TELESCOPE and ASTRONOMY magazines usually in December, January or February or alternatively by accessing the IOTA web site. The relationship of the moon and stars can be seen in earth analogs. 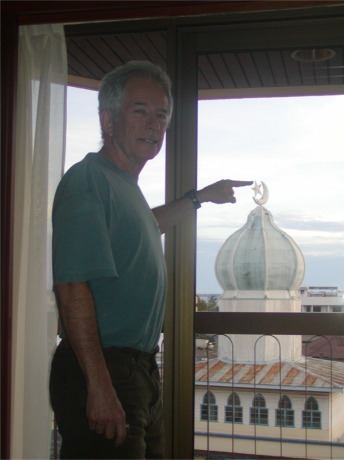 A common one is in the design of mosques as seen above from Sabah, Borneo (February 2006). L. Palmer photo. 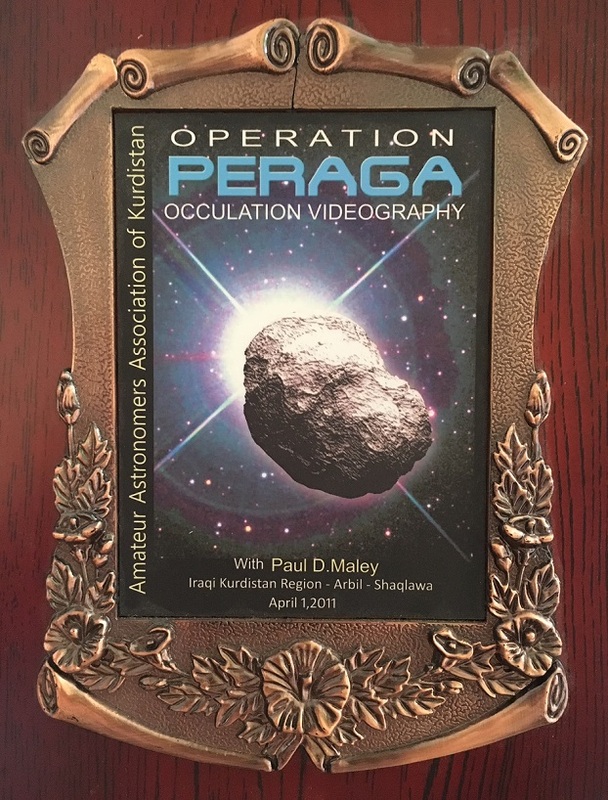 Plaque presented during successful minor planet occultation expedition in 2011 to Northern Iraq. Thousands of small planet-like bodies exist in our solar system called asteroids; asteroids orbit generally between the orbits of Mars and Jupiter. They are usually too small and too far away to be accurately imaged by ground based telescopes. We can indirectly study the shape and size of an asteroid by placing an observer with a telescope in the projected path of an asteroid occultation. This is where an asteroid passes between the earth and a star causing the star to be briefly eclipsed. The shadow of the asteroid is projected onto the earth and crosses a finite area proportional to the asteroid diameter. If many observers are placed in a perpendicular line across the occultation path, their individual timings of the disappearance and reappearnce (or drop in brightness) of the target star will vary depending upon where along the path they are located. In the diagram, the asteroid (about 10 miles in diameter) is assumed to have the ideal elliptical shape shown in green. In reality it is more likely to be highly irregular. As the shadow (created behind the asteroid as a result of the star’s light) passes across the earth, it crosses the 3 observers set up off a small highway. Their telescopes are located so that car lights won’t illuminate them as other cars cruise down the highway. Observer 1 sees a moderately long occultation depicted by the dotted line (e.g. 4.5 seconds) while observer 2 (located near the centerline) sees a very long occultation (10.3 seconds). Observer 3 sess a short outage since he/she is located at the southern edge of the path (1.2 seconds). The closer to the center of the path, the longer the eclipse. The closer to the edges, the shorter the eclipse. The duration of occultation is then proportional to the part of the asteroid that is occulting the star. In the example above, if we were using a real asteroid, the result of the observer’s timings as it relates to the real shape of the body could result in something like this diagram. In the graphic shown below, the result of numerous amateur observations made of the large asteroid Pallas occulting the star 1 Vulpeculae in 1983 is depicted. This is the largest and most successful occultation expedition that I have ever organized. A vast percentage of the contributed data came from amateur astronomers located in the state of Texas. Dozens of timings are combined to reveal the elliptical shape of Pallas. The lower part of the data is missing due to clouds covering the region in Southern Texas at the time of the occultation. 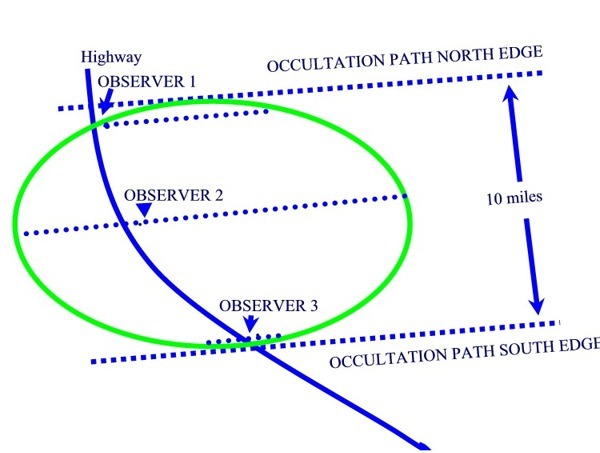 Normally only a few observers are even in a position to actually observe a given occultation because the path of the occultation is confined to a small geographic region and the accuracy of the path can be unreliable. The reason that this particular event was so widely observed was due to the bright star involved and also the large size of the asteroid. This enabled the prediction to be developed months ahead of time with a reasonable amount of reliability. The star was 4.7 magnitude 1 Vulpeculae and Pallas is the second largest minor planet in the solar system. There were 130 timings in all. Up until this time the largest asteroid occultation event had collected 20 timings. Up to 2002, no other asteroid occultation has even come close to this level of grand success. (See the account in ASTRONOMY magazine Feb. 1984, pp.51-54). Observations were made through volunteer efforts made by 262 amateur astronomers in Texas and Oklahoma, 82 amateurs in Arizona and New Mexico, 18 in Louisiana, Mississippi, 28 in California, 80 in Florida and 24 in other locations including professionals. The actual observations made included 68 chords from Texas, 40 from Florida, 6 in Arizona, 4 in Baja California, 3 in Lousiana, and 1 in Mexico proper. The profile was so extensive that Bill Darnell (Houston) was at the very tip of the asteroid, observing a flicker just as the star began a 1.0 second fade to invisibility. Observers north of Darnell saw no occultation. Observers were set up using a parallel chord technique that we developed in the late 1970’s. It was documented in ASTRUM, No. 58, September 1984, p.19. The scheme is rather simple and depends on the orientation of the path of the occultation and its diameter. A series of parallel lines are drawn on a map parallel to the occultation path and north and south of it. The number and distance between them are dictated by the asteroid size (path width) reliability of the prediction and the number of observers available. 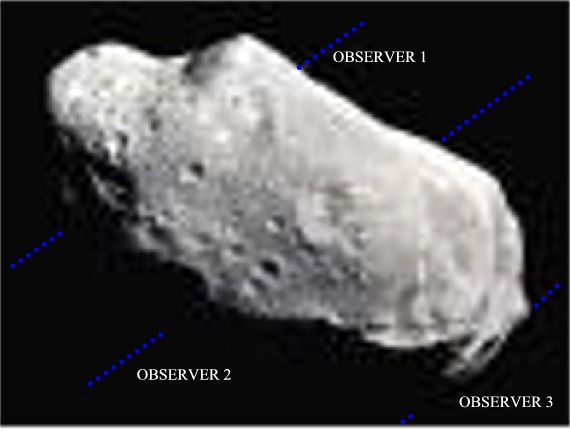 The idea is to ensure that no two observers see the exact same event; that is, since the shadow of the asteroid is cast upon the earth’s surface each observer must see a unique portion of the asteroid in order to properly map it. By using mobility one can find intersection points between each parallel line and major roads which can then be used to find safe, secure observation sites. 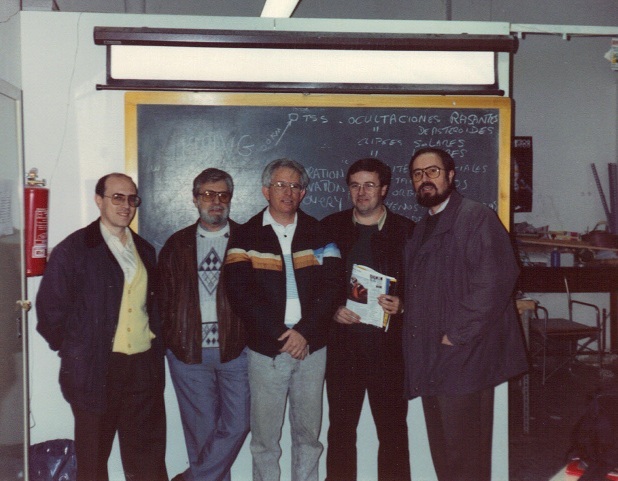 Addressing an astronomical society meeting in Madrid, Spain 1991 on occultations. With a university occultation team assembled in Macedonia in 2009. 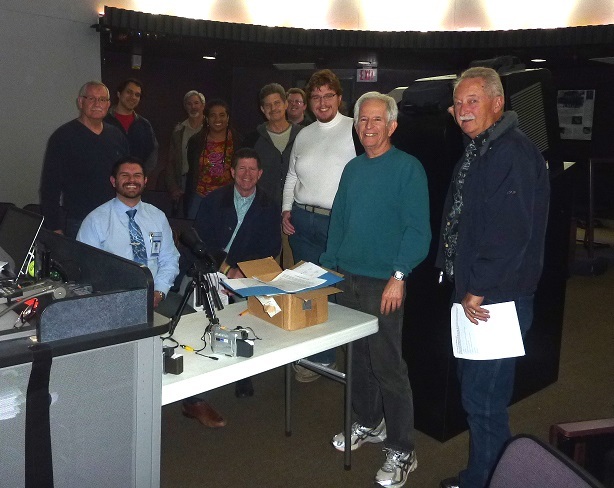 Training new occultation observers in Las Vegas on March 6, 2015 at College of Southern Nevada planetarium. Left to right: Mitch Johnson, Steve Bock (seated), Keith Caceres (standing behind Steve), John Heller (back), Rani Bush, Jim Bethel (seated), Gary Ahlers, Glen Ryan (back), Francisco Silva, Paul Maley, John Crumpley. 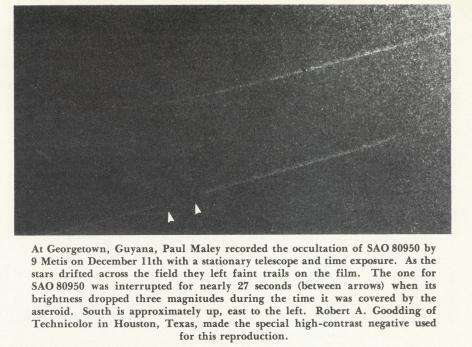 Before 1977 only 7 asteroid occultations had ever been observed! 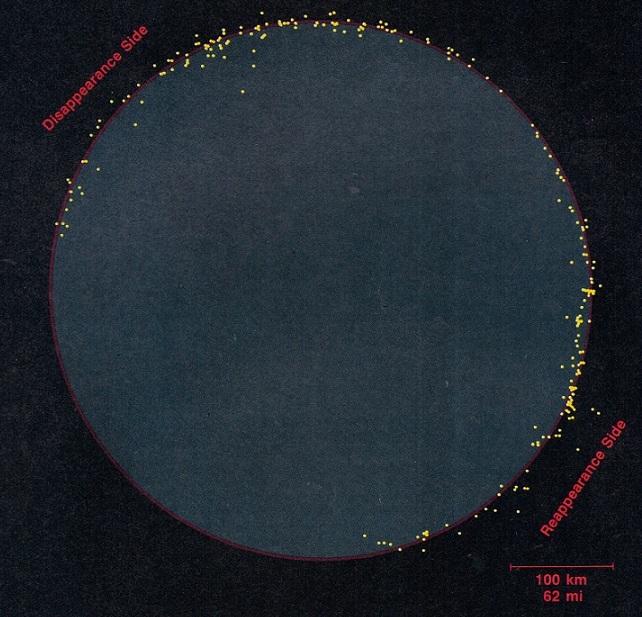 Between 1977 and the Pallas event, observations increased six-fold. When the analysis of the Pallas occultation was finished, 90% of the usuable data was contributed by amateurs. Professional data alone found a value of 522km for the asteroid’s diamter, while 516km was the result from just using the amateur data. This shows the value that off-the-shelf telescopes and tape recorders combined with verbal timings resulted in just a 1% difference in the overall result. We assembled the first compendium of a history of asteroid occultations which was published in 1982 (Revista Mexicana Astronomia y Astrofisica, Vol 5, pp. 213-216) in which 29 events were logged. The first asteroid occultation was seen optically in Sweden in 1958, while the first photoelectric observation of one was made three years later. It is an amazing revelation that amateur astronomers can still contribute valuable science data; this carries forth even in the 21st century. Amateurs are even listed as co-authors of publications in which their observations have appeared, thus providing further recognition of their achievements. Asteroid occultations can occur anywhere on the surface of the earth. A few naked eye stars have been occulted during the past 20 years, but most occultations are of quite dim stars typically between magnitudes +9 and +12. An occultation might occur at any time of night, on any day of the week. A joint expedition with King Abdulaziz Univeristy May 24, 2015 in Jeddah, Saudi Arabia gathers to observe the eclipse of 1.4 magnitude Regulus, the brightest stellar object ever to be occulted. Left to right front: A.Alharbi, R.Alsulami, M.Aldweis, S.Bahamdain; Left to right top: S.Alyami, A.Alshaffi, M. Alshikhi, R.Alaref, A.Alruhaili, L.Palmer, P.Maley, A.Malawi, H.Basurah. 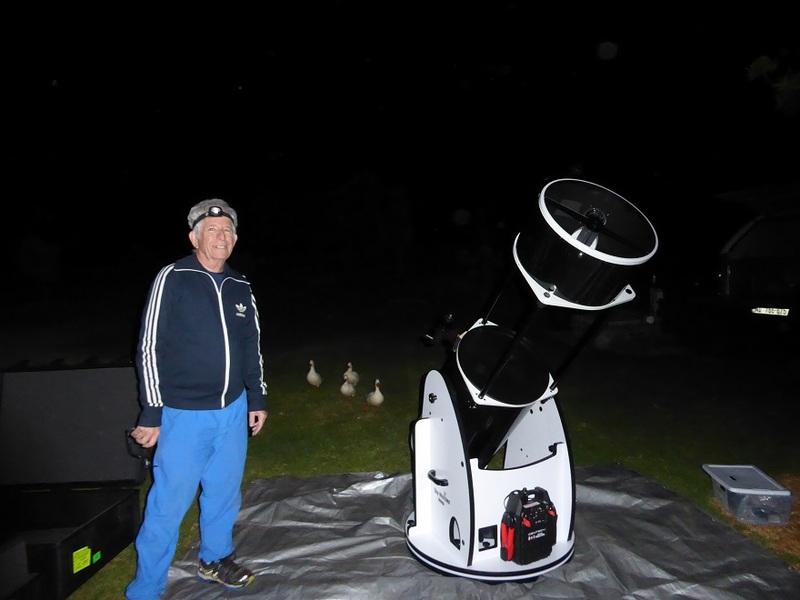 We successfully recorded the Regulus star eclipse from one site. 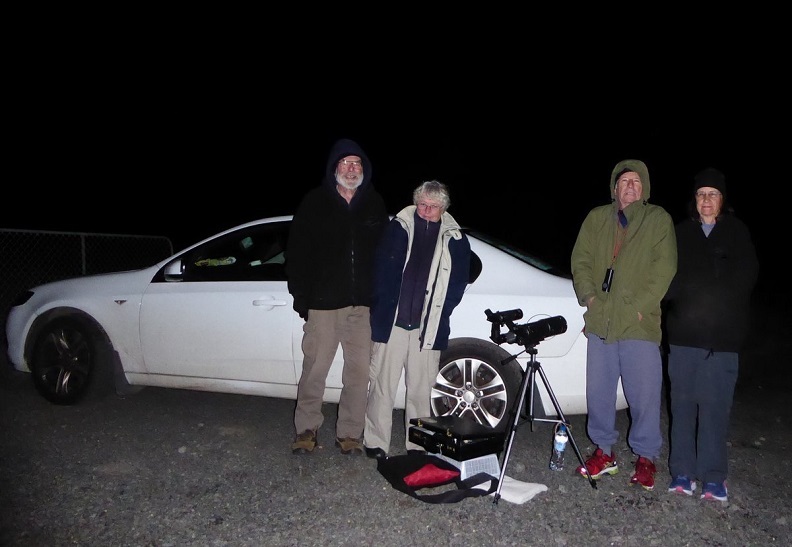 With friends in Gisborne, Victoria, Australia July 14, 2018 recording an occultation of a 9.7 magnitude star by the asteroid Seppina with a Watec 910HX camera and 80mm refractor in 38 deg weather. Wind blowing about 20mph. Left to right: Paul Stewart, Ann Bullen, Paul Maley, Lynn Palmer. It used to be that one usually had to travel large distances in order to intercept an asteroid occultation and even then there was no ‘guarantee that you would see it. Predictions of the actual track of the event are not always accurate. However, the precision of path locations are continuing to become more refined mainly due to improved star positions as a result of the Hipparcos satellite. Images taken by astronomers showing the star and asteroid in the same field of view are attempted weeks before the event. This ‘astrometry’ is then used to update the predicted path. More and more fainter asteroid occultations are being predicted, so that it is likely that at least 5 events will likely cross your area in the coming year. The IOTA web site will also show you the possible error in the prediction, the entire path, which may actually pass over locations where you might have friends who could also attempt the observation. I check the site in advance of any business or personal trip in case one is predicted to fall in that region. Then I carry with me portable equipment in case good weather presents an opportunity. In the distant past I have made one trip to France and another to Brazil specifically to watch a bright star being occulted by a minor planet only to fail because the path had shifted. Such failures are disappointing, but the successes are far more riveting! 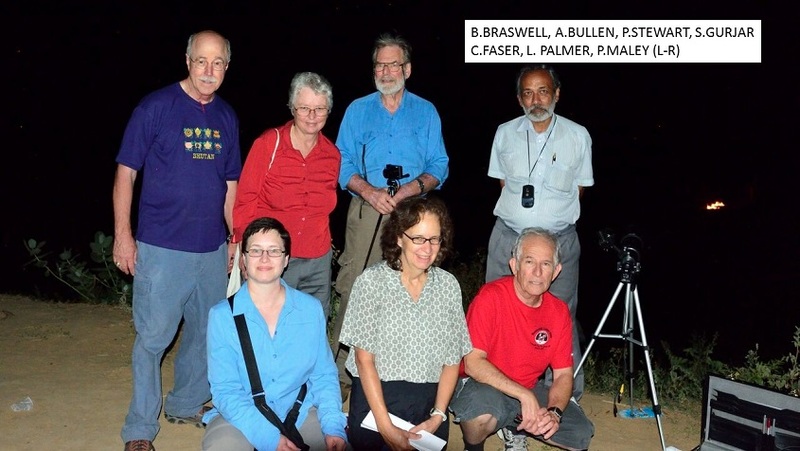 Our first Ring of Fire Expeditions star eclipse team effort at Damdama Lake, India October 3, 2015. We successfully recorded a 25 second occultation of an 8.0 magnitude star by the asteroid 106 Dione in cooperation with the astronomical society Jyotirvidya Parisanstha, from Pune India. 80mm refractor in background as were fires on the lake shore that partially interfered with the video recording. As with solar eclipses we have developed expeditions to observe eclipses of stars by asteroids. Here you have an opportunity to see and explore a foreign destination in addition to assist in capturing information about the shape and size of a minor planet. Observers can either bring their own equipment or I can supply it in country. Under our direction you can video record the eclipse process from of our one or more established sites in order to collect measurements from geographically separated points across the asteroid shadow path as it passes across the Earth. Should you wish to join the International Occultation Timing Association (IOTA), it may be possible to achieve a tax deduction for participation since IOTA is a recognized 501.c.3 organization under the US tax code. Copyright © 2018 - Paul D. Maley. All rights reserved.